Price includes buffet breakfast and all taxes. Children up to 3 years with parents are free of charge. Children from 3 to 10 years have 50% discount. 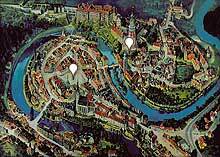 Grand Hotel is in the very center of Cesky Krumlov old town - on the main square Svornosti. All sights are in a short walking distance. Originally gothic building from the end of 15th century has some Baroque features. Recently (in 2005) was building reconstructed for modern hotel purposes. Rich buffet breakfast is served here from 7:30 to 10.30am. Non stop Lobby Bar and reception with exchange office is prepared to arrangedry cleaning / laundry, cultural program, services and tickets. Hotel Grand Restaurant with a summer terrace (on the main square) is a good place for weddings, parties or company trainings. Traditional Czech and international cusine are served by professional team. Selection of good wines is available. You will get a dinner free of charge if you stay 4 nights. There are 14 spacious, modern and luxurious rooms with capacity od 40 beds on 3 floors of the Grand Hotel in Cesky Krumlov. All rooms have writing desk and armchairs or sofa with a coffe table. Deluxe rooms are air conditioned (standard rooms not). Secure parking for 300 CZK is available about 500m from the hotel Grand in Cesky Krumlov. Originally gothic building from the end of 15th century. It gained Baroque features and 2nd floor in 18th century. Classicism had infulence too (facade). Facade was restored to original Gothic - however Renaissance (entrance hall groin vaults from 16th century) and Classicism is still visible. Building across the narrow street is adjacent by horizontal arched buttress at the level of 1st floor. Gothic gateway (contoured consoles) and barrel vaults on 1st floor are remains of former scullery. It homed town hall at first (16th century), than it became residence and in 17th century brewery. Shops (clock shop, butchery, barbery, and dairy) were in place late rand cafe. Reconstructions took place in 16th, 19th and end of last century. Spacious accommodation in an old charming burger house of Gothic origin. hotel with good conference possibilities near the Castle and in walking distance to all major sights. Parking available nearby.